Rick Perry’s biggest hunting worry is the nasty name of his land, but horse lovers have a bigger problem with him. His wildlife officials have been shooting wild burros–again–to make way for bighorn sheep hunting on the Rio Grande. They stopped after public outrage in 2007, but a Freedom of Information Act request shows they’ve shot at least 47 this year, many with AR-15 semi-automatic assault rifle. The recent FOIA documents show two parks employees, Drew Hufstedler and Barrett Durst, somewhat methodically looking for and killing burros. But then Jaime Sanchez, a Dallas County game warden, went out a few times mid-summer with an AR-15. Not a particularly efficient shot or bureaucrat, on June 22 he only hit his target with six of nine shots from a .308 and may have only killed one burro–you can’t tell because from his paperwork. Then on the Fourth of July Sanchez fired this semi-automatic version of an M-16 seven times to take down two burros. Some of his other paperwork is late–not that there’s any repercussion. 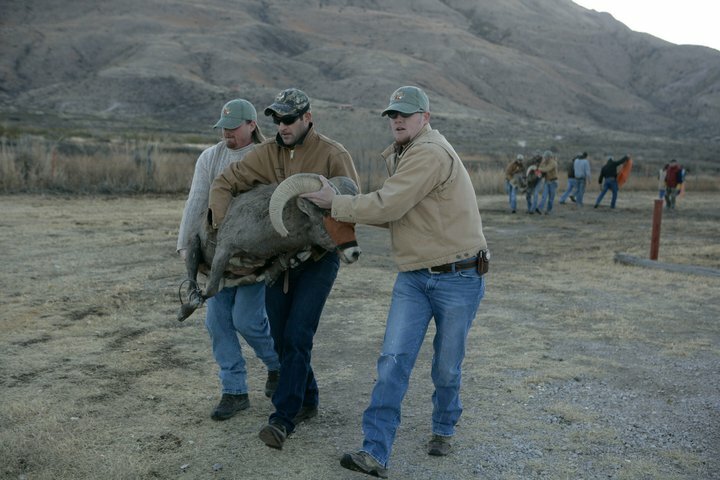 The big is to clear Big Bend Ranch State Park for big horn sheep, which hunters pay big money to shoot. A change.org online petition, already signed by nearly 100,000 people, asks Texas to knock it off. Not the adding sheep part–the shooting of the mules. Since there’s not real solid science that they even interfere. 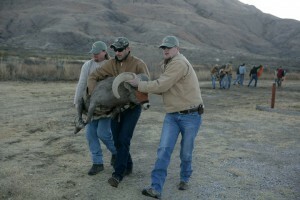 Texas has been working with hunters to bring bighorn sheep to the park to shoot. The Texas Bighorn Society describes it as hard-working volunteers restoring a native species. 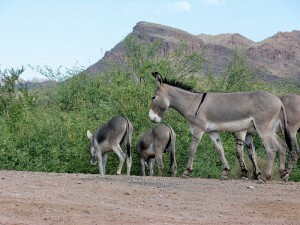 Hunters argue burros aren’t native and compete with big horns and foul the water supply. Mule lovers look at it as a bunch of yahoo hunters inserting sheep to have fun and make money. Van Atta says burros don’t interfere with bighorn, which, even if they were uproariously fun to shoot, might not really be native. The sheep and burros usually live at different elevations and if there’s a drought burros can dig water holes other animals use, she says. The public first found out about shooting wild asses in 2007, when park workers told on state officials, which ended in a big investigation and a plan not to do it again, or at least be more discreet. The testimony showed that State Parks rirector Dan Sholly and regional director Mike Hill just went out and shot at least 71 burros, at Big Bend State Park whenever they were in town for a meeting. Meanwhile, complex manager Luis Armendariz tried to get the USDA to trap them, but they refused. Armendariz says the shooters referred to themselves as the “Yosemite mafia” and that one cryptically told him: “I have gotten rid of 15 of your problems.” Some burro carcasses were found shot in the belly–an unethical way of hunting that leaves the animal to linger in pain. Workers said the hunters seemed to use helicopters to shoot the mules. “Shortly after that, Parks ordered them to take anything out of the gift shop that has anything to do with burros,” says Karen Van Atta. To no one’s surprise, an internal affairs investigation found that it’s powerful wildlife officials had not committed animal cruelty or done nothing wrong. The findings say they didn’t use helicopters or shoot unethically–but the whole thing is by affadavit so I don’t see any way that they even confronted the men with the evidence. They just took their word on it. They don’t comment on using helicopters to shoot burros, so the report officially concludes they didn’t. The shooters, all qualified marksmen, claimed they weren’t doing it for fun, just to make way for the trophy hunting of bighorn sheep. Shooters tried to claim that the burros were just abandoned pets of a recent parks manager, but Van Atta found evidence that predates the manager. Burros, as you may recall, were introduced by Spaniards 500 years ago. Americans have used and abused their remnant populations to haul mining supplies, amuse unethical hunters and make into dog food. But starting in the late 1950s, Americans got a little nauseated by the abuse and eventually passed the Wild Free-Roaming Horses and Burros Act of 1971. The act offers burros flowery compliments, calling them “living symbols of the historic and pioneer spirit of the West…an integral part of the natural system of the public lands.” It generously promises “wild free-roaming horses and burros shall be protected from capture, branding, harassment, or death.” But then it limits protection, so it only applies on certain western lands. The Bureau of Land Management, which is pretty much rancher-owned and operated, can still capture and/or kill them. And apparently, so can the state of Texas under Rick Perry.